If you’re looking for the A to Z post, click on the logo to the left or scroll down. The sun rose this morning at 5:49, long before I did, and will set over 16 hours later at 9:52 this evening. It’s only 3 more days until we lose astronomical twilight, and the sun never dips more than 12° below the horizon. The last of last year’s local carrots. They’re a good inch through, but so tender I can eat them whole. It’s finally warmed up and started to feel like spring, or as much as it can with over 20” of snow still on the ground. But we have icicles and puddles, and the birch tree outside my north window is surrounded by seeds dropped onto the snow. Natural selection in action: birch trees that hold on to their seeds until they can drop them on the snow have the snow melt faster around them, which in turn means the soil warms faster. Smart birches! There are more signs of spring. The Farmers’ Market is taking applications for vendors, and the first market is scheduled for May 11, though of course the first week or two will be mostly handicrafts, not produce! Even garden starts are likely to wait until it warms up a little more. I’m thinking of trying Horse Power in CreateSpace, both to learn what’s involved and to have it to sell this summer at the market. It will likely be well into July before carrots show up, though, and I’m eating the last of last year’s, bought at the Christmas Bazaar put on by the market. I don’t know how they got them to keep that long, as they must have been harvested in September at the latest. I’ve just kept them in the refrigerator, and they are still crisp and far sweeter than any I can buy at the supermarket. Alaska grows really good carrots; it’s too bad our season is so short. The sun will rise at 8:13 this morning. (I get up and this post goes live at 8.) It won’t set for 9 hours 43 minutes, until 5:56 this evening, and we’re still gaining 6 minutes 47 seconds a day. Even seconds add up! Next week the sun will rise before I do, but the week after that we’re back on Daylight Savings and I’ll be getting up before sunrise again until March 18, which happens to be the same day we start getting 12-hour days. It’s really brightened up. This was taken less than a month ago, only about half an hour after solar noon. Why before the solstice? Most obviously, because sunrise and sunset are defined as the time the upper limb is level with the horizon, not the center of the sun. Here, at high latitude, the sun rises at a rather shallow angle, and it takes quite a while from the time the upper limb appears until the whole sun is visible. The moon is full today, but it’s no longer as high in the sky as it was at midwinter – only a little over 30 degrees elevation when it crosses the meridian. It’s been too cloudy to see it, though, or the aurora the active sun should be giving us. For that matter, it’s been a little nippy to go out at night – generally below 0° F, though it’s getting above zero most days. The sun will rise today at 8:38 and set 8 hours, 56 minutes later at 5:33 this afternoon. We’re still gaining about 6 minutes and 49 seconds a day, though the rate of gain is gradually slowing. The weather warmed a little last week, though not enough to make it excessively slippery; but this week looks as if the highs will barely make 0°F, with the nights as cold as 30 below. We’ve had very little additional snow, and very little is forecast for this week. But the sun is much higher in the sky; it’s almost 14° above the horizon at noon. My first dog, Derry. 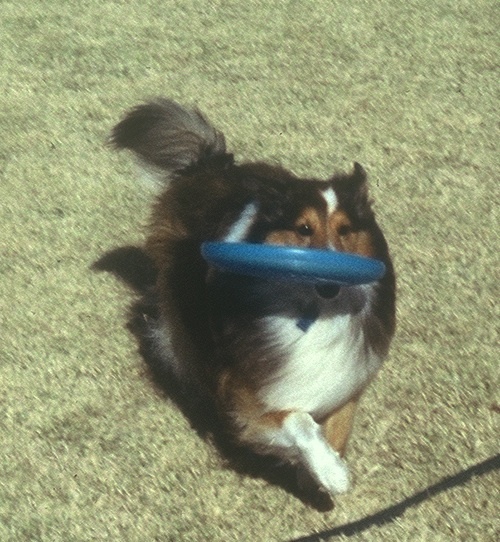 I’d forgotten how he always turned a frisbee upside down to carry it. March and April are going to be busy; I signed up for 10 adult learning classes, thinking I wouldn’t make the draw in all of them. Well, I did. In March I have a class on Andrew Lloyd Wright’s musicals, one on the 1964 Alaska Earthquake (which I vividly remember as it lasted about 2 minutes in Fairbanks), health Issues and a harmony singing class. Then in April I’ll have 6 classes spread over 4 days a week. I’d better get some posts pre-scheduled, or I won’t have time to do them. At least there is no homework and no tests! I have most of the slide scans indexed now: only a disk and a half to go. Still haven’t heard back on the super 8 film, but it may not have reached iMemories yet. It’s been a trip down memory lane, even if the vast majority of the slides are pretty hopeless. The group I sent out last week included some 2 1/4 x 2 1/4 slides I couldn’t get digitized locally, taken with a camera I owned before I even got the 35 mm. The sun will rise at 9:02 this morning, and set 8 hours 8 minutes later at 5:10 this evening. Sunset is now after 5; I’ll soon be able to attend afternoon lectures! It’s warmed up a little, but thankfully not so much that the roads were too slippery to attend the critique session yesterday afternoon. 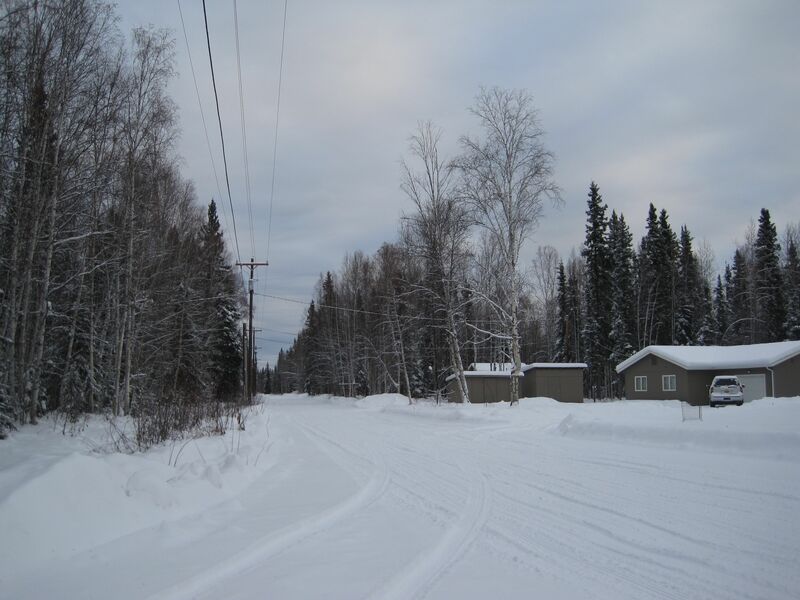 We’ve had a little snow over the last week – enough that I’m thinking of getting the driveway plowed again. The all-wheel drive could handle keeping it rolled down if I were going in and out every day, but I’ve been making it out only about twice a week lately, and I’ve killed the engine backing out a time or two. The snow stake says the depth is approaching two feet, so at least we’ve about made up for the settling. I tried to crop the photo so the bottom of the photo is the base of the stake. I have not tried to walk out to the stake! I got back the digitizations of the rest of the 35mm slides last week. Some I know I took are still missing; some I’d totally forgotten about were there. 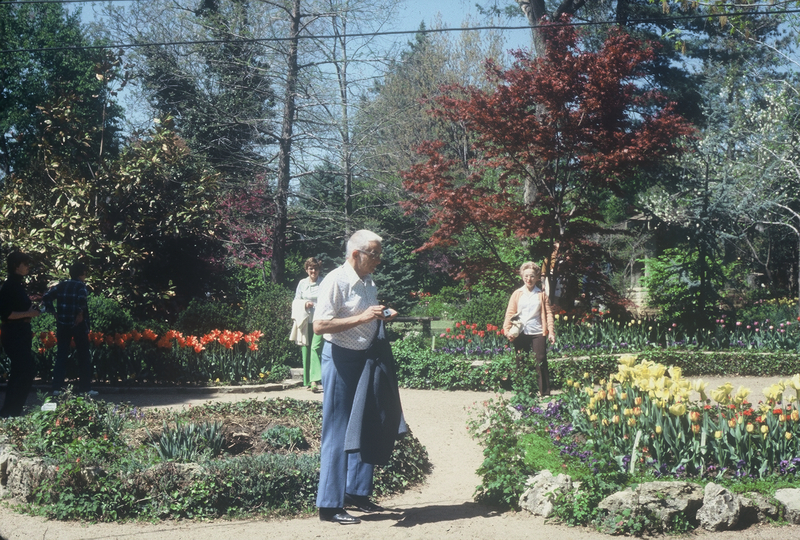 I took one group in 1978 when I visited a botanical garden in Wichita with my father and his second wife, 8 years after my mother died. I couldn’t remember the name of the place so I googled “public gardens Wichita” and finally found it: Bartlett Arboretum, in Belle Plaine, KS. Really a beautiful place, and we visited in tulip time. Now I need to get the 2 ¼ x 2 ¼ slides, the Super 8 movies and the videotapes done, but at least I have managed to look at the movies and see that some are worth saving. White ice, or rather snow on its way to being white ice. This is the road I live on. The sun will rise at 10:09 this morning and set at 3:57 this afternoon, giving us 5 hours 47 minutes of “daylight.” I actually saw the sun from my window last Thursday, and we’ll be up to 6 hours of daylight by Wednesday. It’s still not what you’d call warm – temperature back and forth around 0°F – but it’s warm enough for us at this time of year. The rain a week ago we can do without! That rain is still here, as far as the effects are concerned. 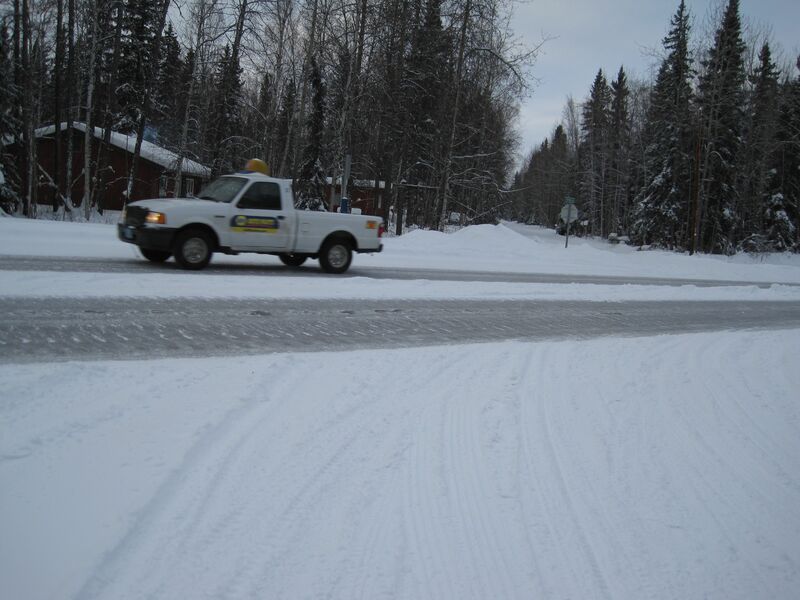 Roads are covered with white ice and gray ice, though very little black ice. They’re all covered, though, and correspondingly slick. I found myself fishtailing a little going around corners, after staying home for several days. And how many places do you know where they cancel school because the temperature is above freezing? They did, a week ago. But the seed catalogs are starting to pile up! Spring should be coming sometime! The darker lanes are gray ice. If you look closely, you can see where bits have chipped off, giving a much darker color. I got another batch of slides in for digitizing, including a couple of hundred I took when I took the long way around returning to Alaska (the first time I drove the Alaska Highway, back when only the first hundred miles were paved.) As I recall, I managed to hit quite a number of parks and monuments going north from the Grand Canyon to the Canadian border between the Rockies and the Sierra Nevada, all the time traveling with two Siamese cats who started yowling the minute we got off the pavement and continued until we crossed the Alaska border and got back on pavement. I hope the photos aren’t too faded; I might share some of my memories of that trip. Still no more snow, though it’s been warm lately – back and forth around zero, with some days warm enough that the roads are pretty slippery. What snow we have has settled to only about a foot on the ground, though there’s been no melting yet. Not that I’m expecting any, barring record high temperatures which I hope we don’t get. I hate dealing with the icy glaze a thaw now would put on everything. There’s some chance of snow in the forecast, but only a chance. I hope we get more soon, or pipes will start freezing. Still a strong inversion, and air quality is still unhealthy. Flowers are indoor only this time of year. 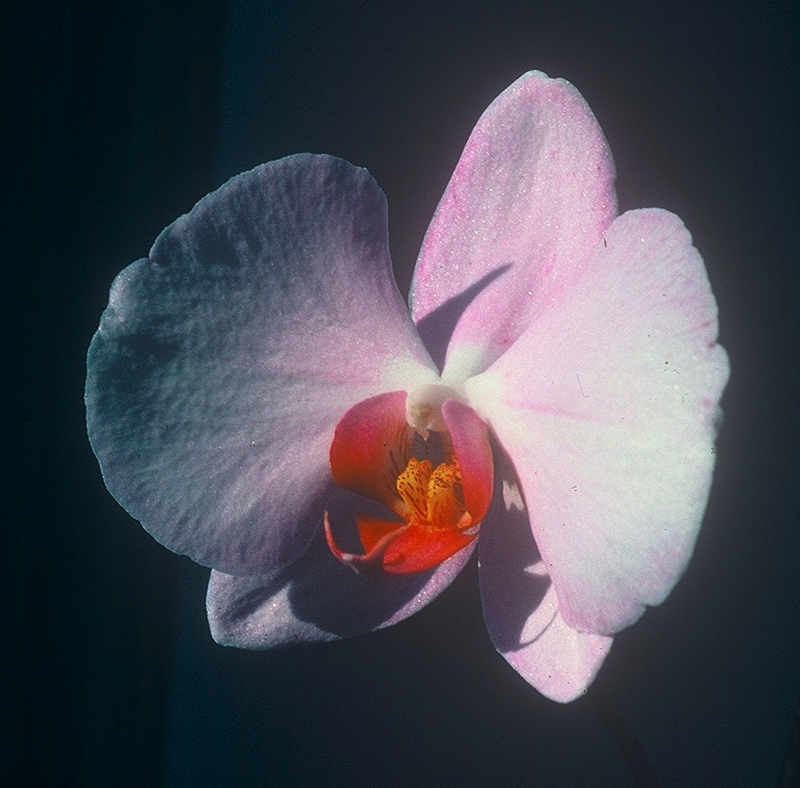 The photo is actually one of the old slides I had digitized, and is at least 25 years old. New Years’ Eve, and the sun will rise at 10:55 this morning and set at 2:52 this afternoon for not quite 4 hours with the sun above the horizon. We’re gaining about 3 minutes a day now, and it’ll be up to 4 minutes a day by next week. It’s warmed up quite a lot, though we haven’t had any further snow. Lows are generally about 0°F or higher; highs are still well below freezing but feel positively balmy after the 40 below we had. The air pollution, though, is still quite bad — very unhealthy is the official level. It’s still beautiful, all pink and blue. I’ll put up a really old photo later in the week, but the ones with today’s post were taken about an hour after solar noon last Thursday. An hour after solar noon, and less than an hour til sunset. Dec. 27. Even the smokestacks look pretty. Well, our day length dropped below 4 hours today. The sun will rise at 10:44 this morning and set at 2:44 pm, but we’re a few seconds short of a four-hour “day.” The sun is only 2.4° above the horizon at midday, so we effectively have sunrise blending into sunset. The amount we’re losing per day is rapidly decreasing though, and the solstice is only 11 days away. I am looking forward to the days getting longer again. The Riverboat Nenana, decked out for the Holidays. I once taught dog training classes on the lower deck. At least it’s warmed up a little. Yesterday was the first day in quite a while with a temperature above 0°F, and we had about an inch of snow. The last look I got at the snow stake the depth on the ground was up to 7”, but we may have received more last night. (We did. Make that 8″ as of 10 am, though it’s still far to dark for a picture.) Maybe if it stays warm they’ll get the downtown Christmas decorations up. So far, the main municipal lights I’ve seen are the ones out at Alaskaland Pioneer Park. 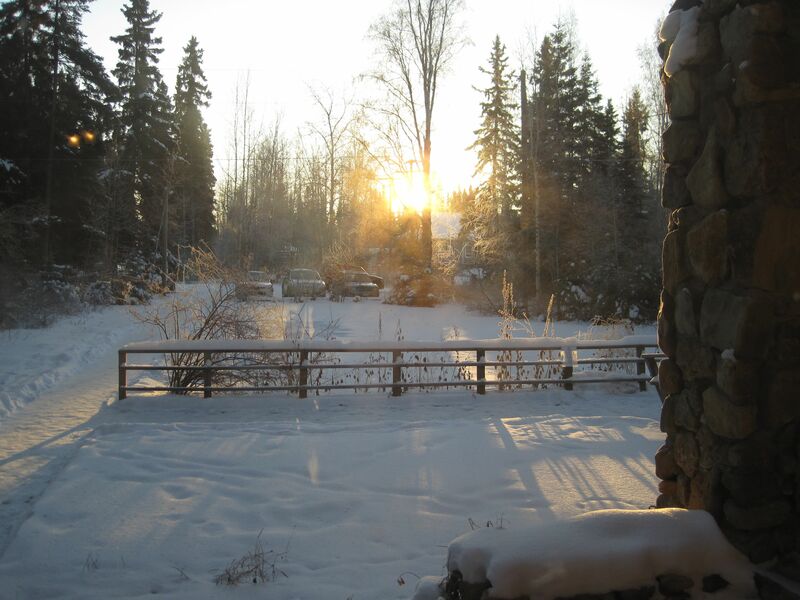 One of the things about living in Alaska is that you get really tuned in to the seasonal variation in day length, sunrise and sunset times, and temperatures. Here in the Interior we have an extreme continental climate, which means major temperature changes (the Fairbanks record temperatures are 99°F and -66°F) while staying relatively dry (we’re technically a desert based on mean annual precipitation, though it’s downright boggy in places.) We tend to get really excited about the winter solstice, when the days start getting longer again, though it arrives before the coldest month of the year. Not being able to drive in the dark, I’m really looking forward to the longer days. P.S. at 7 pm: the weather report tonight has a winter storm watch in effect from early Wednesday morning to Thursday afternoon, with 4″ to 10″ of snow expected. Maybe we’ll get some ground insulation, but I may have to have the driveway plowed. P.P.S. sunset (2:43 pm) Tuesday: It’s snowing and the snow stake was already up to 10″ when it got too dark to see. The winter storm warning (no longer just a watch) doesn’t even start until tomorrow morning. The sun will rise at 10:27 this morning, and will set 4 hours 28 minutes later, at 2:55 this afternoon. At its highest it’s barely 3°, 6 times its own diameter, above the horizon, which explains why the light throughout the day looks like sunrise – pink with blue shadows. 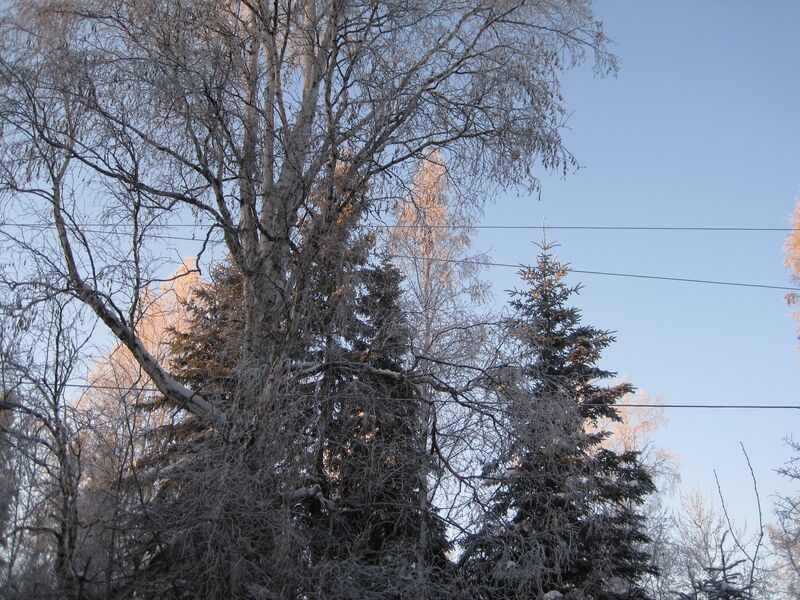 The birches are well covered with frost, which gives a fairyland effect. 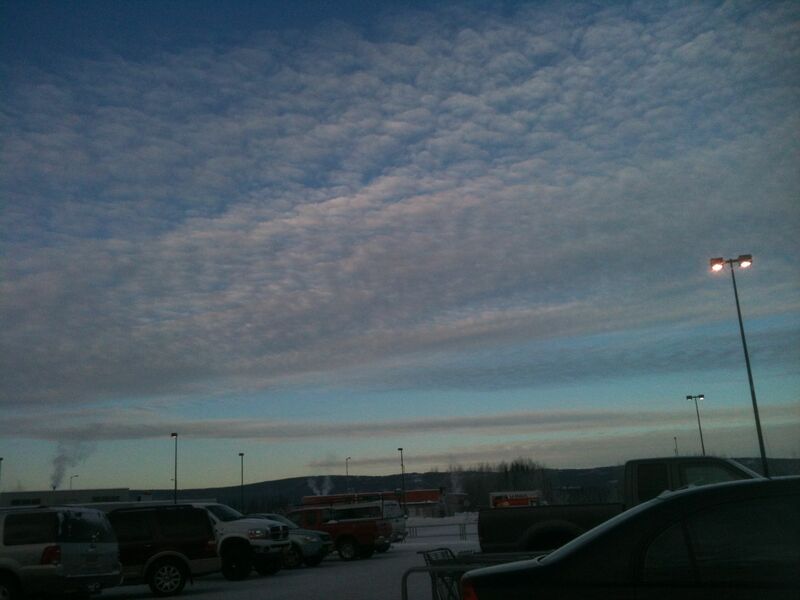 8:00 this morning, 10 degrees below the official temperature of -38. More of the same is forecast, though some clouds are expected, Still, no above-zero temperatures in the forecast. 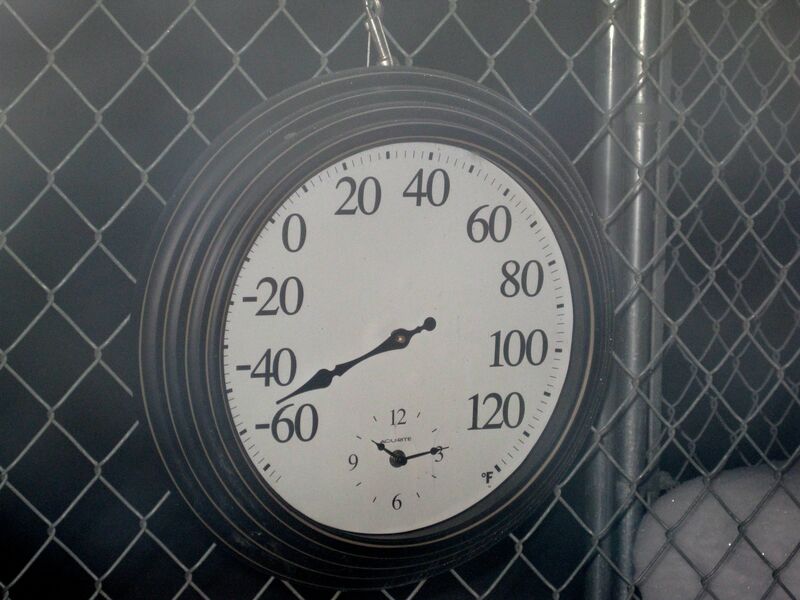 My thermometer has been reading lower than the official temperatures, and Sunday morning it was somewhere below -40. How far below I’m not sure–the electronic thermometer starts reading LL whenever it’s that cold. Too cold to go outdoors, anyway! It warmed up a bit during the day yesterday (somewhere in the low – 30’s) but by sunset it was back to LL. The dial thermometer, which wasn’t too far off the electronic one while both were working, said 45 below at 9 pm yesterday. This morning, with the electronic still reading LL, it was at -48°F. Final report: the manuscript of Rescue Operation is now ready for my editor when she gets back. The sun will rise at 10:06 this morning, and after 5 hours 5 minutes it will set at 3:11 this afternoon . We’re now losing less every day – 5 minutes and 47 seconds today. The solar altitude at noon is only about 4° above the horizon, and the sun barely makes it into the house. We’re slowly getting closer to the sun, as usual this time of year, but it certainly doesn’t feel like it! Looking south from Wolf Run at solar noon, 11/24/12. That’s as high as the sun gets this time of year. To show how short the days are: Saturday I left a little after sunrise for a haircut, lunch, automatic teller at bank and three stores, in all of which I knew what I wanted and where to go. No lines to speak of. The sun was setting as I started home, with the gibbous moon shining in the northeastern sky. (The full moon is highest when the sun is lowest.) The skies are still clear, and the daily highs struggle (often unsuccessfully) to get above 0°F. 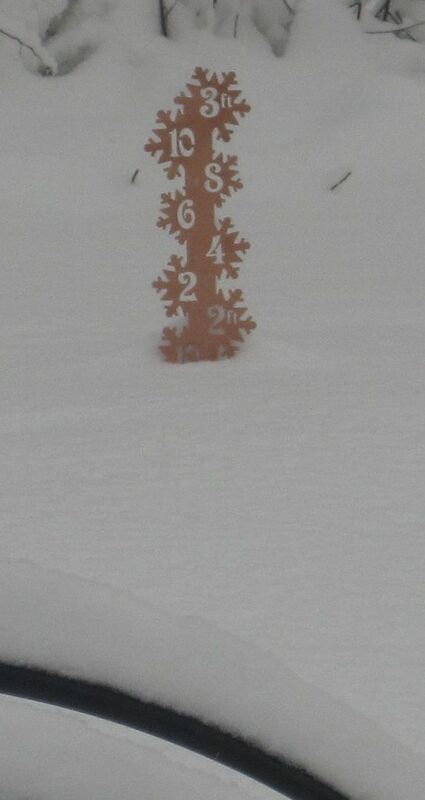 No snow since last week, and the snow stake is still sitting at 6”. The clear skies have a price — inversions and the resulting air pollution. Once that meant carbon monoxide, but improved car design has largely eliminated that. Now our problem is fine particulates, largely from wood smoke. Appallingly, a recent Borough election voted down local controls — which means leave it up to the EPA, since we are far out of compliance. This morning the radio warned that the particulate level was unhealthy even for healthy people, and a friend of mine on oxygen is housebound and miserable. I’m a little excited about this evening. The science fiction and fantasy group at our local library is reading my first book, Homecoming. I’ve been invited so they can talk to a real, live author. I’m running low on bookmarks — need to print up more. Also some business cards with my web addresses. I still need to write up one more Inner Council meeting from Zhaim’s POV, letting him come to the conclusion that he has to get Roi out of the way somehow. My editor’s not going to be back in town until next month, so I should be able to finish the changes before she’s ready for the next round. There’ll be more changes, of course – there always are. But I’m happy with the effect of adding Jacyn’s and Zhaim’s POVs. Or should that be points of view?